We have furnished all the latest details of the TS Junior Lecturer Hall Ticket 2019. Moreover, the officials of the Telangana Residential Educational Institutions Recruitment Board (TREI-RB) had released the TS Junior Lecturer Admit Card 2019 on 7th February 2019. 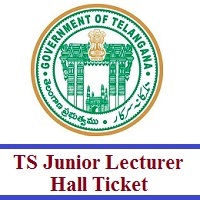 Those who have applied for the 281 Junior Lecturer Posts and searching for the treirb.telangana.gov.in Junior Lecturer Hall Ticket 2019 can focus on this page to get the exact information to download the TS JL Admit Card 2019. And the higher officials had mentioned the TS Junior Lecturer Exam Dates 2019 on their official portal itself as 16th, 17th, 18th, 19th, 20th February 2019. So, to score more marks in the upcoming తెలంగాణ రెసిడెన్షియల్ ఎడ్యుకేషన్ ఇన్స్టిట్యూషన్స్ రిక్రూట్మెంట్ బోర్డ్ test, you need to work hard. While downloading your hall ticket, you need to use your registered number, password details. Further sections give you the detailed TREIRB Selection Process 2019, the direct link to Download TS Junior Lecturer Hall Ticket 2019 through the official site online. 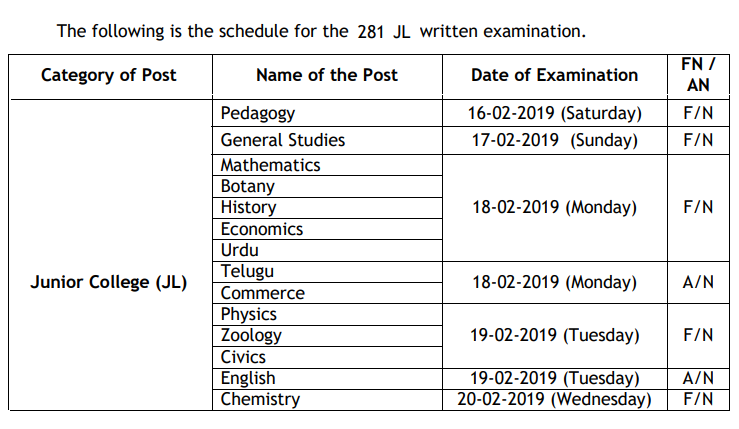 Check the below image that refers to the latest TS Junior Lecturer Exam Dates 2019. As the official exam dates are released for the vacant Junior Lecturer posts on the official site @ treirb.telangana.gov.in, we have tabulated and kept in this section. In this section, you can find the accurate selection process through with the higher authorities hire suitable candidates. The తెలంగాణ రెసిడెన్షియల్ ఎడ్యుకేషన్ ఇన్స్టిట్యూషన్స్ రిక్రూట్మెంట్ బోర్డ్ officials are planning to perform two rounds through the TREIRB Selection Process 2019. The applicants will be subjected to written examination of Paper-I, Paper-II & Paper-III of Objective Type and the provisional selection will be made in order of merit based on the total marks secured in all the (03) papers. Candidates would be called for certificate verification and demonstration in the respective categories duly following the Rule of reservation in the ratio of 1:2. Below are the listed documents which are necessary to carry for the examination. So, candidates while attending the JL Written Examination, you must take any of the identity proof along with the TS Junior Lecturer Admit Card 2019. Well, candidates should follow the below steps to Download TS Junior Lecturer Hall Ticket 2019 online. So, those who are facing issues with any server or links, they can check and follow as per the below instructions. Moreover, you can only download it online. And no other means is provided. Initially, candidates have to make a move to the official site of the Telangana Residential Educational Institutions Recruitment Board (TREI-RB) @ treirb.telangana.gov.in. In that home page, navigate to the What’s New section. Furthermore, you need to search for the link that refers to the TRIERB Admit Card 2019. Soon after observing it, hit on it and then enter all the required details like the Application Number or Register Number, Password or Date Of Birth. Now, you can see your TS Junior Lecturer Hall Ticket 2019 on screen. Download, save it and also take out the printed copy of the hall ticket for the further use. For more updated information about the TS Junior Lecturer Hall Ticket 2019, you need t stay tuned to our Freshers Now web portal.